As we drove into the car park of the Horton Inn, in Wimborne, I was immediately struck by how lovely the country pub looked. The front beer garden, bedecked with fairy lights and parasols, looked like the perfect place to enjoy an evening beer – I’ll be going back this month for that! As Mum and I walked in, I remembered that the England v Croatia game was on, thanks to some England flag decorations placed around the doorway, as well as a room full of football fans, all hushed in anticipation for the game to start. (We arrived just before 7pm). Shelley Sims, the manager, greeted us cheerfully and took us to our table, near the back garden. The pub was quiet because the football was on and it was lovely to have the room to ourselves. The pub is massive and would be good not only for family meals but for big parties as well. Shelley immediately put us at ease. I often find being waited on uncomfortable but I didn’t feel like that at all here. She and our waitress were chatty and incredibly friendly. Shelley took over in April and in the three months she has been managing the pub, all the rooms have been refurbished, as has the car park and the food is now locally sourced where possible and home cooked as well. There is also live music on some evenings at the Horton Inn, including Grizzly and the Grasshoppers on 7 September and Pronghorn on the 15 September. 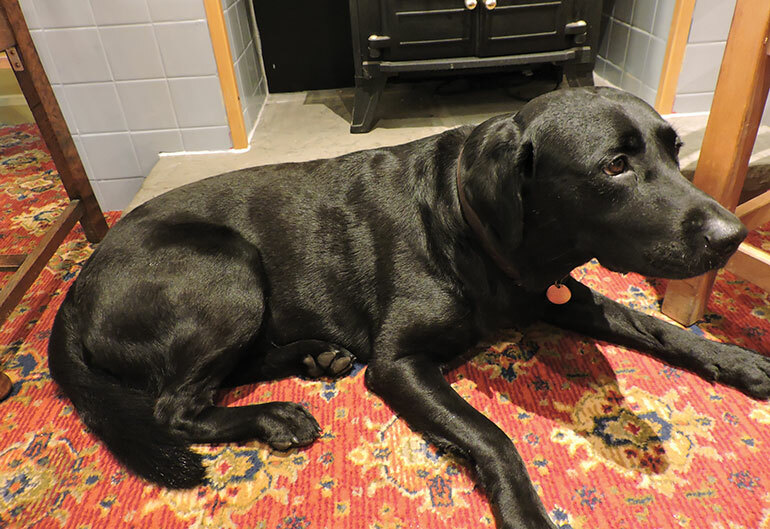 We were also delighted to meet Dennis, Shelley’s gorgeous Labrador. He lay next to our table for most of the evening, scared of the football fans’ excited shouting, and he really made our visit enjoyable. In fact, Shelley brought over dog biscuits after my mum asked if she could get some from her car to reward him for shaking paws with us and sitting. I had to stop Mum on occasion so that she didn’t overfeed Dennis. Shelley stressed that the pub has a relaxed atmosphere and is really dog-friendly, which is perfect for the pub’s wonderful country setting. Almost as soon as we sat down, we heard a great roar as England scored. We certainly scored when the food arrived, incredibly quickly, I must add. 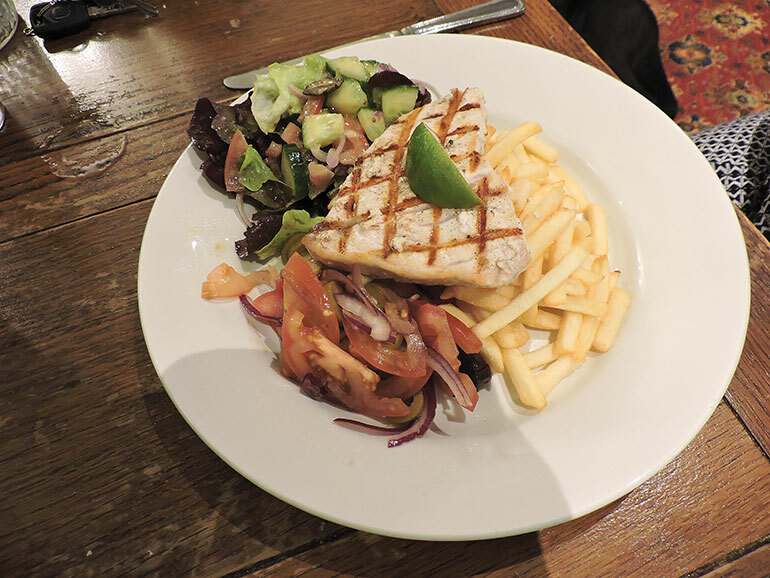 Mum chose to order the chargrilled swordfish steak, with skinny fries, slaw and a red onion, tomato and olive salad, whilst I opted for the Horton BBQ ribs (half rack) served with French fries and homemade slaw. We were also tempted by the Dorset venison burger and the oven baked tiger prawns – perhaps ones for next time. As we both wanted the swordfish, but thought it wouldn’t be fair to eat the same dish when reviewing the food, we decided to share our meals and split the dishes between us. The ribs were tender and had a lot of meat on them. 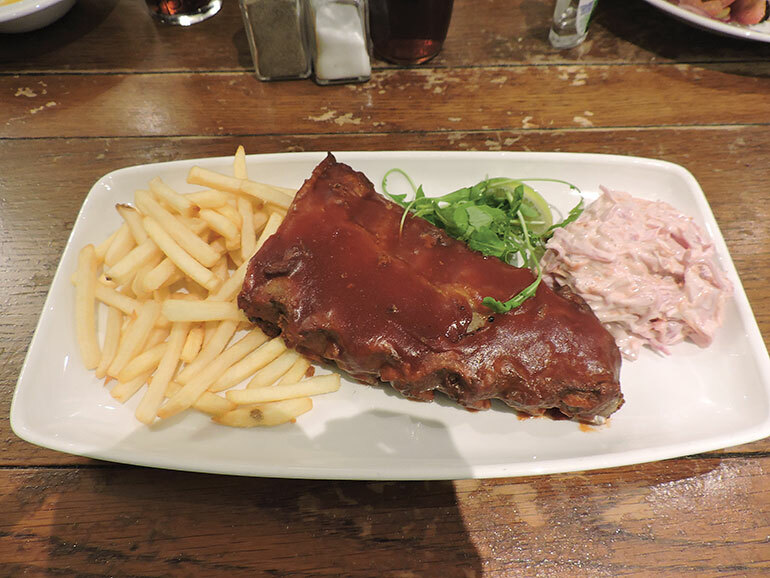 The barbeque sauce added a lovely sweet, smoky flavour to the tender ribs whilst the crispy, salty skinny fries were the perfect accompaniment. The homemade slaw was similarly smoky, almost chipotle-ly in taste and went well with the rest of the dish. Mum loved the swordfish, as did I. The fish steak had a lovely subtle flavour and the drizzled lime on top complemented it exquisitely. The dressed salad was sharp and tangy, perfect with the delicate swordfish. Both dishes were presented very well and I even had a fingerbowl to go with my ribs, which I definitely needed. Although we didn’t hear any excited clamours from the other room, we were excited for our final dish. The Horton Inn had some lovely desserts on offer, as well as a variety of ice creams. Mum chose the Knickerbocker Glory, whilst I chose the white chocolate cheesecake served with cream and a strawberry coulis. I was told by Shelley that this was a good choice, so was really looking forward to it. When they arrived, both looked magnificent. 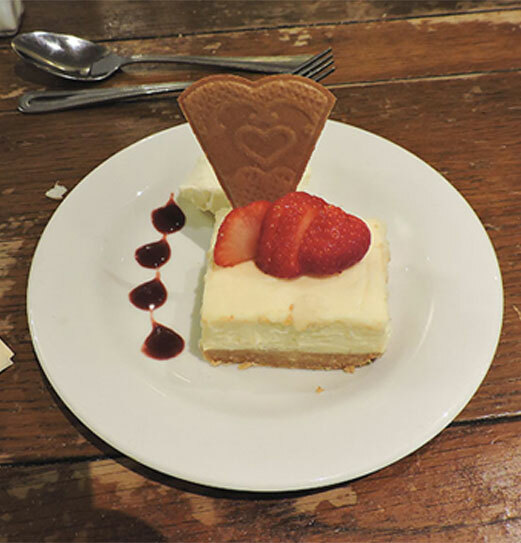 The white chocolate cheesecake had a rich, thick, creamy filling on top of a crumbly crumb-biscuit base. The tart strawberry coulis balanced the sweetness of the cheesecake well. I also loved the taste of the cream on the side, but for me, it wasn’t necessary as the cheesecake filling was already so creamy. Mum enjoyed her fun and colourful Knickerbocker Glory as well. The pub had both vegetarian and pescatarian options as well as a lot of choice for meat-eaters. Portions were quite large and very filling and the food is affordable as well. What’s not to love? As well as being dog friendly, the pub seemed family friendly and relaxed. As we were preparing to go, I heard a customer call out to a waitress, “That was absolutely delicious, thank you. You tell the chef.” If that’s not a good sign, I don’t know what is. Although England lost out on the World Cup and the evening for some was a little deflating, our evening was absolutely lovely and our visit to the Horton Inn certainly made us feel better about the result. At least there is good food in the world!